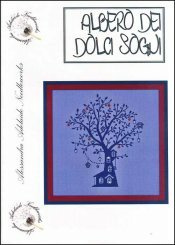 Albero Dei Dolci Sogni [D6961] - $15.88 : Yarn Tree, Your wholesale source for cross stitch supplies. Cross stitch pattern by Alessandra Adelaide Needleworks. A tree with a house for the tree trunk. The branches are filled with lanterns, tiny birdhouses, and fruit. Stitch count 183w x 219h.